A south-facing 100 sq/mtrs canal side apartment on the Dorsoduro, which is one of the quietest and most sought-after areas of Venice. The apartment lies 2 minutes from the delightful Zattere and 1 minute from charming Campo Santa Margherita. It is close to all the major sights, but away from the main tourist traps, making a stay here restful even in the busiest months. The whole interior has recently been restored (2007). Rooms are bright and spacious and most have moulded plaster ceilings with old Murano chandeliers; floors are of travertine limestone, carrara marble or ceramic sandstone. 2 of the 3 bedrooms look out over the canal and the living room has a very large comfortable sofa bed. The apartment has a separate well-equipped kitchen. 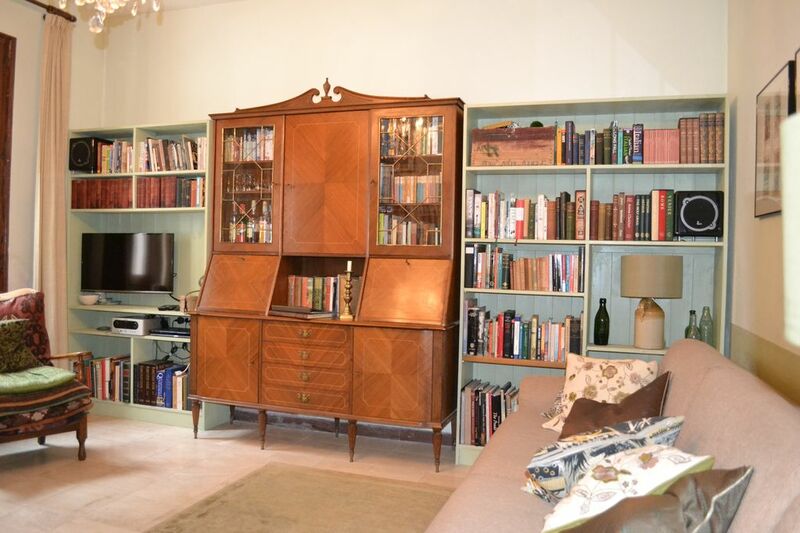 Other features include wi-fi internet, flat-screen TV, DVD player and stereo, film library and a comprehensive selection of Venetian-themed books. The apartment is beautifully furnished throughout with a mixture of contemporary and antique styles. There is a a cafetiere and a stove-top espresso maker. Spices, condiments, coffee, tea etc are provided. I used to be a chef so you'll find everything you could want in the kitchen. The apartment has a very well equipped separate kitchen. The outdoor area by the boat landing is not private to the apartment but is there for your use. Belissimo! Perfecto! Must stay again. What an incredible house. I cannot wait to come and visit year after year. Grazie Mille! I wish I could write a novel about the house and the experience. Just do yourself a favor and book. Beds comfy, everything we needed and more. Ciao Bella! Thank you David and staff. David (the owner) has gone out of his way to make this apartment comfortable and homely. From the moment we met our greeter at the meeting point I knew we were in for a great stay. However, the short walk from the canal to the apartment filled us with joy, what a beautiful location. The photos on the site do not do the location or the apartment any justice, it truely is a wonderful place. Thank you David for all you have done to make this lovely apartment so special. We loved this apartment and David was so easy to communicate with. His collection of books on Venice is outstanding. Each of us had stacks of books on our bedside tables. The kitchen was fully equipped for cooking and we enjoyed meals in the apartment. This apartment is so cozy and warm. Dorsoduro is away from the throngs of tourists, but easy to walk everywhere. We wished the internet had been more robust - we rebooted it as instructed, but it was still spotty. I live in a house with spotty internet so I understand that sometimes it just can't be helped. Nevertheless, our stay was wonderful and the books more than made up for the internet! The hot water and shower were outstanding. I would absolutely stay here again in a heartbeat, and look forward to returning. Guilia, our greeter, was a delight! A really lovely apartment,very comfortable and well equipped.great location.highly recommend. We had a great stay here,felt very homely and welcoming.so nice to be right on the canal in a quiet spot,yet very close to supermarket,restaurants and coffee bars. We found the apartment spacious and well equipped,and would recommend to anyone. We really enjoyed our stay here and the neighborhood was nice and quiet. We are a family of 5 and found that there was plenty of room here. The rooms were comfortable and worked great for our needs. The neighborhood was nice and quiet since it is not located in one of the noisier areas. The family room was nice and big and there is a great collection of books, including some of the classics. Everything worked great and it was nice being able to cook our own meals. I really wanted to like this home. The host was wonderful and the check in process was great as well as we were given so much information on things to do and see. The location is also quite nice, but the air conditioners do not really do anything and it was so hot and humid that everything just felt wet and smelled musty. I know Venice is an old city with old buildings, but we stopped at a friends' rental who was also there and that place was not musty. Everything just felt old and a bit dirty and the humidity did not help. And we were not allowed to run the air conditioners overnight, yet being on the first floor we were not comfortable leaving windows open in our children's rooms. We enjoyed out time in Venice and appreciated the location very much. Thank you for providing us a place to stay. Immediately outside the apartment is the church of San Sebastiano, whose celebrated interior was the 24-year-long project of local artist Veronese. Close by you'll also find the Academia and Guggenheim galleries, the Frari, the Scuola Grande di San Rocco and the Scuola Grande dei Carmini. The famous Ca' Rezzonico (including its useful vaporetto and traghetto stops) on the Grand Canal is a 2 minute walk away. 20 minutes on foot will take you to both San Marco and the Rialto. Prices include the new Venice tourist as well as final cleaning, laundry and all bills. The only added charge is a 'meet and greet ' fee payable locally €35.00 (€55.00 for arrivals after 8pm) Prices quoted above are for parties of 1 - 5 guests. 5 guests maximum including adults and children. Christmas, New Year and Carnival will be charged as High Season. Minimum 3 night stay - although a 2 night stay may sometimes be possible - please enquire.